China's central and local governments have scrambled to provide information on the environmental and health impacts following last week’s deadly explosions at a chemicals storage facility in Tianjin – but criticism is mounting over the lack of clarity about the causes of the disaster. Local authorities continue to withhold details on assessments of the storage site’s suitability to store dangerous chemicals as technicians try and manage the clean-up. Of particular concern is contamination at the site from a store of 700 tonnes of sodium cyanide, a highly toxic chemical that can cause severe breathing difficulties and death if inhaled in large enough quantities. By the early hours of Wednesday, the official death toll was 114, including 39 firefighters and five police officers. At least 70 people are still missing, most of them firefighters, while almost 700 people are injured. At a press conference on Monday, Bao Jinling, the chief engineer for the Tianjin Environmental Protection Bureau, admitted that surface water at the site had been badly polluted. He also acknowledged that sodium cyanide has been detected in 17 places, with the worst pollution closest to the blast, four times the permitted limit. Meanwhile, environmental group Greenpeace is producing satellite imagery of the safety zone which it says will aid the evacuation of residents and take emergency measures, should pollution spread. However, while the Minister for Environmental Protection Chen Jining arrived at the site on the evening of August 16, authorities responsible for industrial safety have been notably absent, while safety assessments for the site haven’t yet been made public. At press conferences, journalists have been cut off by officials when questions are asked about the close distances between residential buildings and stores of hazardous materials. Even the People’s Daily has noted that “unclear”, “unknown” and “unavailable” have become buzzwords at the seven press conferences held since the disaster. Residents of Tianjin want to know why hazardous materials were stored only 600 metres from apartment blocks and who, ultimately, owns the company that operated the chemical storage facility. Those who lived close to last week’s blasts have held demonstrations and have demanded compensation. Yet the chain of command and responsibility for the site remains unclear. A government spokesperson wasn't even able to say who is in charge of overall rescue efforts. With the authorities in Tianjin unable to answer the public’s questions, China’s increasingly active “netizens” are building their own information platforms to discuss the blasts. In the People’s Daily public opinion section, online forums noted that questions asked at the press conferences were blocked or dodged – while video, written reports and reporters’ notes placed on the internet gave a fuller picture. 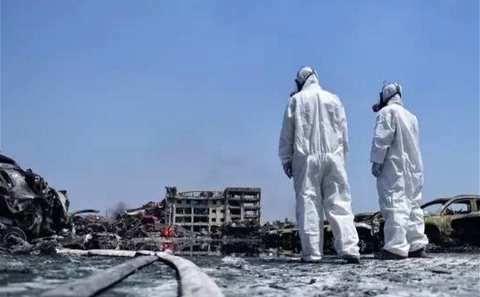 Because the blasts should be classified as an industrial accident, safety assessments rather than environmental assessments should be the primary focus, said Wang Canfa, head of the Environment and Resources Law Institute at the China University of Politics and Law. Many in China will be maintaining the pressure on the authorities to publish those safety documents soon, as one of the country’s largest urban areas comes to terms with a disaster that ranks among the country’s biggest industrial disasters in recent times.